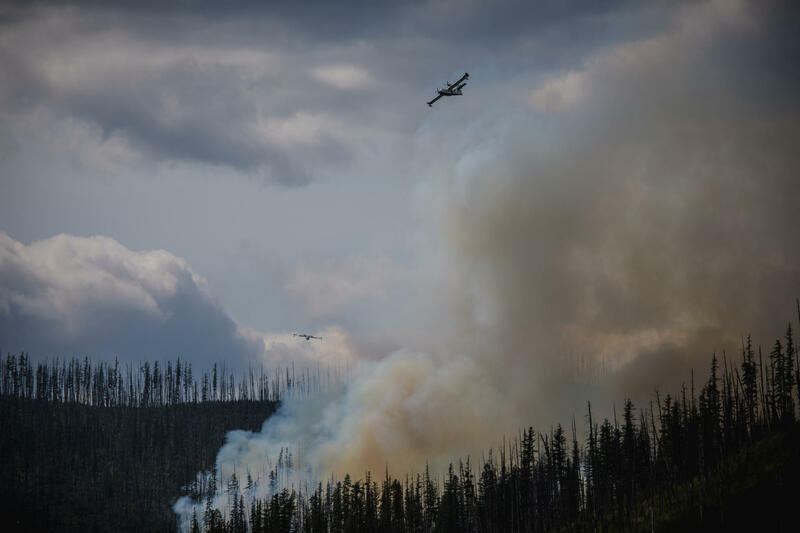 CL-215 Superscooper Airplanes Drop Water on the Howe Ridge Fire in Glacier National Park, August 12, 2018. Nicky Ouellet: Yeah Eric I'm at the park headquarters in West Glacier. There are about 70 people here. There were park staff including superintendent Jeff Mow on hand to describe the firefighters' efforts to quell the flames and then kind of walk through what homeowners themselves thought as the fire made a run toward some of their homes and just kind of gave them some details from the firefighting end of things. EW: What did you find out about structures that were lost to the fire? NO: The park has not come out and said exactly which structures have been lost or how many. But I am hearing from homeowners that Kelly's camp which is one of the original homesteaded inholdings in the park, several structures within that camp has been lost. Right now there are some folks inside the community building who are looking through pictures of their homes. Some of them are burned and they've asked media to step out for that section. There are also a couple of cars from campers who were heading out on a Trout Lake Trail and got stuck there and had to hike out on the opposite side of the trail, but their cars did not make it out. EW: What are people saying? NO: There's a lot of thanking the firefighters. A lot of rounds of applause for the firefighters. But people are pretty upset that there wasn't a faster response from firefighters. The fire was detected on Saturday night and ground crew went in, but it was just not safe enough to send them inside there to try to engage with the flame. It's burning through the Robert Fire scars from 2003. There's a lot of downed timber in there that could fall and be really dangerous for firefighters. They did get some helicopters and super scoopers on it yesterday morning but that wasn't really making a dent. People were upset that there wasn't a stronger response faster. They were also upset that there wasn't more warning for the evacuation notices. Since then, a couple more private inholders have gotten word that they should start getting ready. But there haven't been any further evacuation orders at this time. 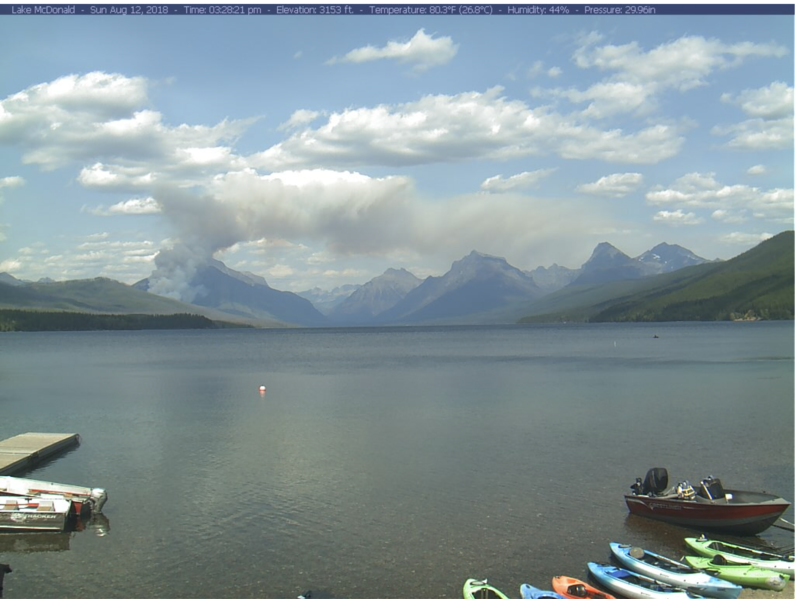 EW: When you talk about efforts to protect the homes and cabins in the area there, Glacier did get some some help from outside without it, right? NO: Yeah absolutely. Flathead County sent in a structure protection team, and people had sprinklers going on their own homes. The homes were not left to be burned. EW: What's happening on the fire now? 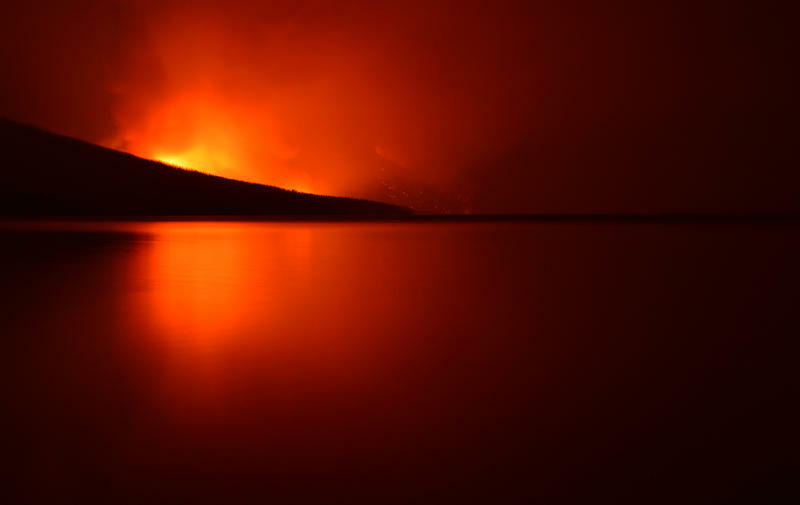 NO: Right now the fear is that it will kind of loop around the northeast tip of Lake McDonald and start making its way down what's called the South Shore to end up at the Lake MacDonald Lodge, and that is not what's happening. Fire is moving kind of up the ridgeline but they are watching to make sure that it doesn't send sparks out on the ground or even across the lake which was a fear yesterday. EW: Nicky Ouellet, thank you.